Are Fevers Good or are they Bad? Fevers are actually the body’s way of fighting bacterial infections. So many parents think that they are doing the right thing by rushing for medication to try to ‘break’ the fever when it strikes, but in actual fact, this is doing a lot more harm than good. Studies have found that aspirin and other fever-reducing medications actually suppress the production of antibodies, thus resulting in the infection lasting for up to 50% longer than it should. On average, a body temperature of 37C/98.6F is considered ‘normal.’ This doesn’t take into account the fact that children are generally warmer than adults. Recent exercise, dressing too warmly, consuming hot foods, and even the menstrual cycle in teenage girls can cause the body temperature to rise by a degree or two. Fevers tend to hit their highest point at late afternoon, so if your child’s body temperature is slightly higher than normal at that time, it is generally no cause for panic. But if your child awakens and has a low-grade fever, you may want to encourage him/her to stay at home and get some rest, so that the fever can do its job of fighting any infections which may be present. There are however times when medical attention should be sought for high fevers. 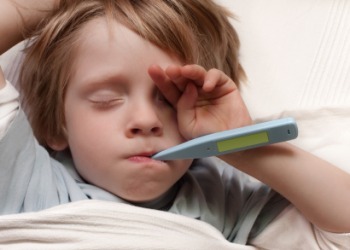 These include fevers in children younger than 3 months, who have a fever of more than 100.4F. (While waiting for medical attention, try to breastfeed the infant, as mothers’ milk contains natural antibodies made at the breast as it comes into contact with the pathogens in the baby’s mouth.) Medical attention should also be sought for children between 3 months and 3 years old, who have a fever higher than 102.2F, and for anyone who has a fever higher than 104.5F. What can be done to make children feel better during these times is to ensure they get plenty of rest and liquids. Avoid sugary liquids and foods as these can significantly suppress the immune systems’ ability to fight the infection. Try not to force them to eat, as they will eat when they are ready. A good home-made chicken broth will normally suffice, as it is easily digestible.